The Curmudgeon grew up a big sports fan – both a participant and a spectator – thanks to his father. Family legend has it that he was consistently making contact with pitched balls by the time he was three, and while he never had much of an athletic career, he always felt he got as much as he could out of his ability. He was a high-skill, no-talent player, meaning that he had an advanced understanding of all of the sports he attempted to play and played them all with considerable skill, but there’s only so much you can do when you have no real athletic talent, and the older you get, the more you realize that all the skill in the world can’t make up for being small, slow, and not very strong. So there was a lot of little league sports, mostly but not entirely baseball, in The Curmudgeon’s family and a never-ending stream of sports on television (or what passed for a never-ending stream back in the days before cable television, which only came into The Curmudgeon’s life in the late 1980s). More important, there was a great deal of participatory sports in the family’s life. The Curmudgeon’s brother is just sixteen months younger than him and was a genuinely talented athlete, and this created a wonderful sports partnership; if they weren’t in school, sleeping, eating, or doing homework, the brothers were playing some kind of ball. When there were other kids around after school and on weekends they played baseball (or variations of baseball), football, or hockey, and when there were no other kids around they still played: pitcher-catcher (one brother pitches, the other catches and calls balls and strikes), wire ball (a city game involving throwing a ball straight up and trying to hit overhead telephone wires), and first base (one brother throws semi-elusive ground balls and the other has four seconds to return a cleanly fielded ball to its originator); football – things like practicing catching the ball one-handed, catching the ball over your shoulder, snapping the ball to a holder (seven yards away) or punter (fifteen yards away), and keeping both feet in bounds when catching errant passes (the key: wedge your toes against the street curb, lean over, catch the ball, and then quickly shift the ball into just one hand while using the other hand to break the inevitable fall over the curb); and hockey – shooting puck after puck after puck after puck, as hard as you can, at a brother dressed in totally makeshift and at times inadequate goalie equipment. The center of the participatory sports life was the garage. Most kids had a toy box; The Curmudgeon and his brother had a sports box filled with all manner of bats and balls and gloves and pucks and sticks. Other than a truck and a gun at their grandparents’ house, the brothers had no other toys (okay, technically there was a shoulder-mounted bazooka that shot blue plastic bombs, but all the brothers did was swing at the flying bombs with their baseball bats). To this day, The Curmudgeon keeps his sports equipment, used less and less with every passing year, in his garage – except for his multiple baseball gloves, which should never be asked to withstand the harsh winter temperatures of a garage. One spring day, maybe eight years ago, The Curmudgeon was retrieving his basketball from his garage after a winter’s hibernation; in warm weather months, he drives around with a basketball in his back seat because, well, you never know when you’re going to drive by a court and get the urge to spend fifteen or twenty minutes trying to hit open twelve-foot jump shots. On this particular occasion, though, The Curmudgeon recalled one of the adornments of the family garage of his youth: a framed photo of the 1973-1974 Stanley Cup champion Philadelphia Flyers. He wondered whatever happened to that photo and then realized there was no need to wonder: he picked up the telephone and called his father, who took custody of the photo in his parents’ divorce but hadn’t had a garage in years. A week later, the photo was in The Curmudgeon’s possession, and a few days after that it was on his own garage wall. A few years ago The Curmudgeon stopped to look at the hockey photo one day – he can still identify every player on the championship team – and concluded that it looked lonely up there all by itself, and so he decided to devote an entire wall of his garage to a gallery of local sports heroes. He then spent the next year or two gathering photos and posters he already had and then finding and purchasing more and setting them all in inexpensive frames. When he was ready to hang them, though, he realized he needed to prepare the wall first, so he painted it – bright, bright Philadelphia Phillies red. 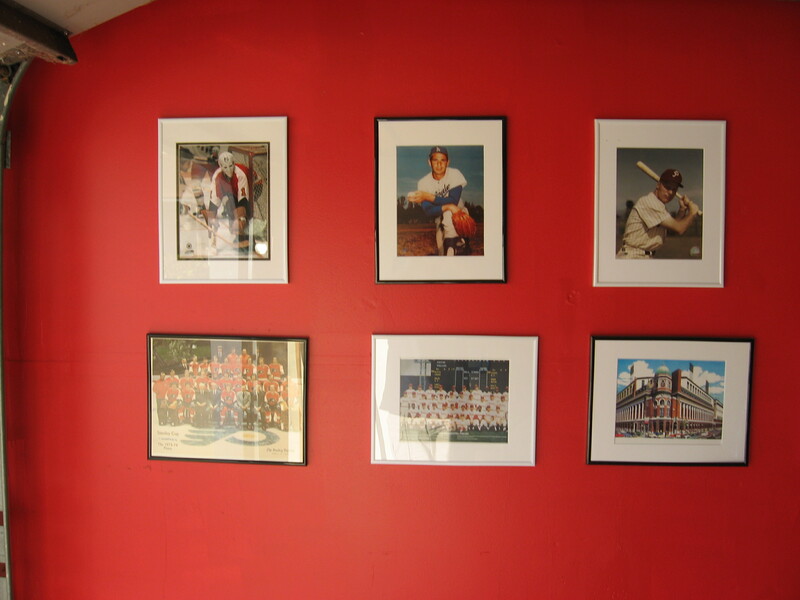 And then he started hanging the framed photos: team pictures of the 1964, 1980, and 2008 Phillies; the 1974 and 1975 Flyers; baseball players Richie Ashburn, Richie Allen, and Johnny Callison, blasts from The Curmudgeon’s long-ago past; and hockey players Bobby Clarke and Bernie Parent, the latter of whom The Curmudgeon wrote about last year. He added two outsiders, too: Sandy Koufax, a long-time hero about whom The Curmudgeon also wrote in the past; and Bobby Orr, only the greatest hockey player ever to lace on skates. But the prize of the collection is a baseball player you never heard of – someone no one who visits this space has ever heard of: an obscure old-time Philadelphia Phillies player named Vance Dinges. As noted above, The Curmudgeon’s lack of athletic talent hindered his development as a baseball player. His father used to say that he ran “like you have an ice box on your back,’ and it was true. The Curmudgeon never could run very well, and a bar mitzvah lesson accident (not a misprint) that left him in a cast for five weeks destroyed the little running ability he did have. Dad then took to calling his eldest son “Vance,” later explaining that his running style was reminiscent of an old Phillies player named Vance Dinges. It would be years before The Curmudgeon would discover the Baseball Encyclopedia and learn how mediocre a player Vance Dinges had been: he played 159 games for the Phillies during the 1945 and 1946 seasons, batted just 553 times, hit only two home runs and knocked in just forty-six runs. He threw and batted left-handed and played half of his games at first base and the rest in the outfield, and all that action at first base suggests that he probably wasn’t much of an athlete. He made his major league debut at the advanced age of thirty – most likely, history suggests, because of the player shortage caused by World War II – and was out of the major leagues by the time he was thirty-one. He also played for thirteen different minor league teams, mostly in small cities throughout the eastern U.S.
During the course of finding the artwork for his new gallery, The Curmudgeon visited the web site of the Philadelphia Athletics Historical Society – yes, there really is such an organization – in search of a picture of the stadium where the Phillies once played their games. Originally called Shibe Park, and then later Connie Mack Stadium, the ballpark had long been a source of fascination and interest to The Curmudgeon. He once worked near it, while in college, and it shows up every year or two in his dreams for reasons he can’t even begin to comprehend. 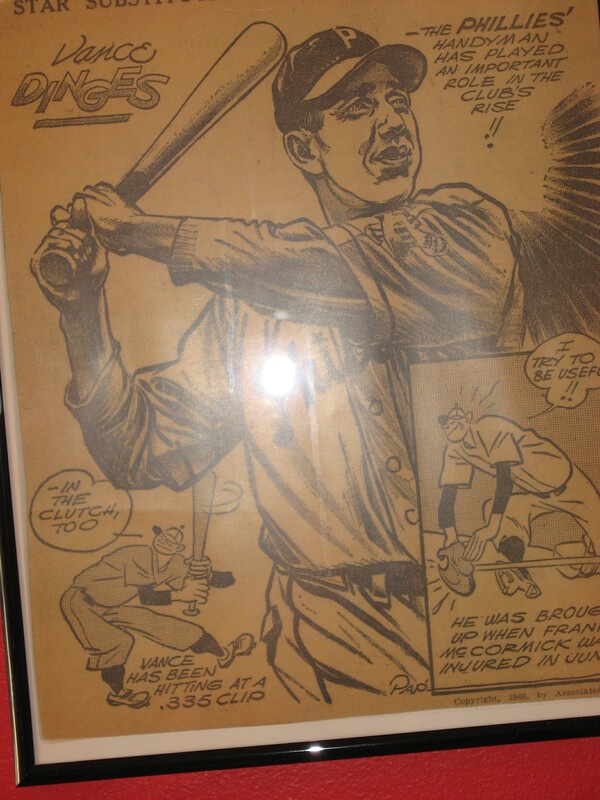 While he found the stadium picture he sought on the site, he also found – so improbably as to border on the miraculous – a poster of the one and only Vance Dinges, the only poster of a non-star player the society offered. He ordered both, and now Vance Dinges sits, surrounded by far brighter stars, swimming in a field of bright, bright Phillies red in The Curmudgeon’s garage. When The Curmudgeon told his father about the new gallery, dad was excited and asked for a photo of it. Garages, however, don’t photograph very well, and after a few attempts, The Curmudgeon informed his father that if he wanted to see the gallery, he’d have to leave his home in southern California, so close to Disneyland that you can hear the fireworks that launch the parade that ends the day at the theme park, and see it for himself when he came to visit. But that’s not to be, either, and that’s going to take some getting used to.